Traveler Guitar's Ultra-Light Nylon is the smallest, lightest full-scale nylon-stringed acoustic-electric travel guitar they've ever made. It features a proprietary In-Body tuning system that utilizes standard tuning machines relocated into the body to create a guitar that has a full-scale neck, yet is substantially shorter than full-size guitars. The lack of a headstock and a small, ergonomic body allow the guitar to be 20% lighter and 29% shorter than a full-size classical, all while preserving the same full-scale playing experience you’re used to. Complete with a Traveler acoustic piezo pickup and a standard 1/4" output, you can plug this guitar directly into your favorite amp or recording device. The guitar weighs less than three pounds and is only 28" long, so it can go wherever you go. The lap rest can be removed for storage and transportation, allowing the guitar to fit easily in an airline overhead compartment in the included gig bag. The Traveler Guitar Ultra-Light Nylon acoustic-electric is the perfect solution for traveling players unwilling to compromise on scale length, but still looking for the smallest and lightest solution available. 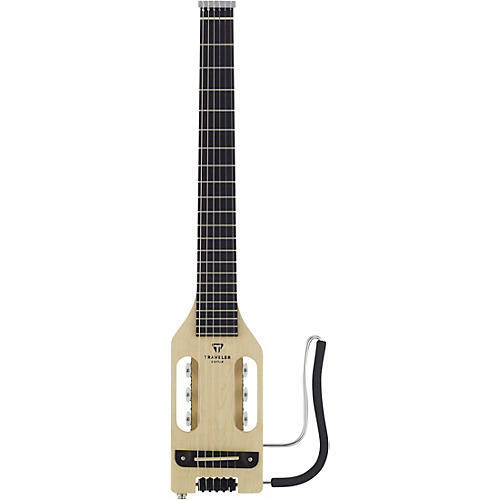 Grab this fun-size guitar today. The Speedster comes with a three year limited warranty. The Traveler Pro-Series comes with a three year limited warranty.